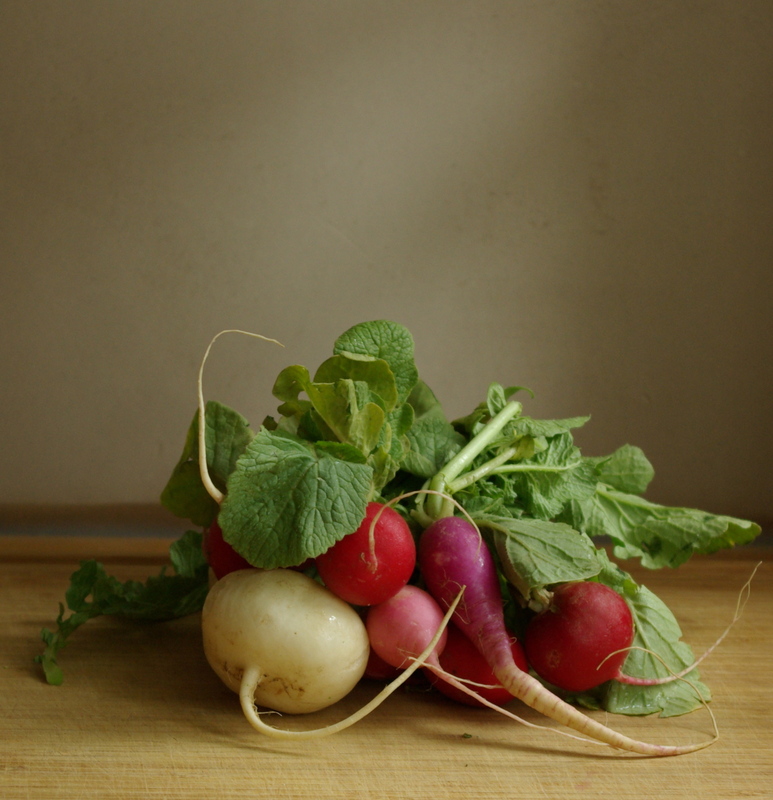 Inspired by P. Allen Smith’s use of radishes, these radishes make a lovely pasta dish. They are sautéed and braised with onion until sweet and mellow. Tossed with the radish greens, parmigiano reggiano, and reserved pasta water, the resulting dish is flavorful and light, perfect for summer. In a large saucepan with deep sides, heat 1 T extra virgin olive oil over medium heat. Once warmed, add the diced onion with a pinch of salt, cook 3 – 5 minutes just until they begin to give up some moisture. Add sliced radishes. Add another pinch of salt and cook, turning often, until they lose most of their moisture, about 10 minutes. Be careful not to burn the vegetables, turning down heat if necessary. Begin making pasta. Once the radishes and onions have lost most of their moisture, add broth, braise on medium low heat for 10 – 15 minutes until the vegetables have absorbed most of the liquid. Stir in butter if using. To the vegetable mixture, add torn cleaned radish greens, al dente cooked pasta, grated cheese, 2 T. reserved pasta water, toss to combine. Add pasta water 1 T at a time if a looser consistency is desired. Salt and freshly ground black pepper to taste. Serve with another sprinkling of parm reggiano if desired. Serve immediately. Makes 3 generous servings. This entry was posted in Pasta Dishes, Vegetarian. Bookmark the permalink.